Whether the garage is used for car parking, for storage or for any other use as the owner may deem fit the garage doors need to be functioning properly for the garage to serve its intended purpose. The truth, however, is that just like with other things garage doors malfunction, get damaged or break down with continuous use. When this happens, repairing or replacing the garage door parts involved is the only way to get the garage door and, in turn the garage to work as it is supposed to. One of the parts of the garage door that is prone to malfunctions and damages is the door panel and given that the panels make up the body of the garage door care should be taken when addressing any problem concerning garage door panels. Below are some common issues with garage door panels and suggestions on what can be done in each case. 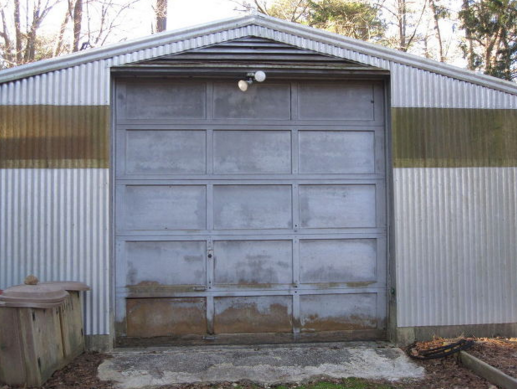 Normal wear and tear tops the list of common issues with garage door panels. Most wear and tear problems are aesthetic as opposed to mechanical and rarely interfere with the functioning of the door. These problems include but are not limited to dents, rust, wraps and cracks. In case of wear and tear, regular maintenance is all that is required to ensure that the garage door panels remain in good condition. Applying a fresh coat of paint is effective in preventing rusting and giving the panels a new lease of life just like applying some filler in a crack will ensure that no further cracking happens, at least for some time. The secret here is to know the best solution for each problem if you want to do the panel maintenance for yourself. The easier way however would be to get garage door panel repair services from someone who understands what each type of garage door panels requires to ensure that the garage owner gets the best out of the door panels and the entire door as a whole. Accidental damages occur when an object rams into the door panel and either dents it or completely shatters it. 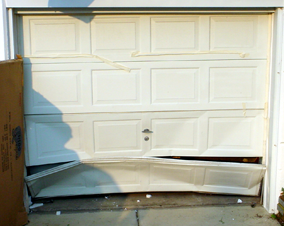 Accidental damages on garage door panels also occur when earthquakes, hurricanes and other natural calamities occur. The extent of damage depends on the object in question and the impact on the panel and damages caused by a falling tree will be different from the damage caused when a vehicle accidentally rams into the door panel. The type of panel used also matters and the damage on a steel door panel will be completely different from the damage on a wooden panel. All in all accidental damages are in most cases serious and may go beyond the door panels to other parts of the door. Care should, therefore be taken to ensure that the safety of those who may come in contact with the door is not compromised. Where just a single panel has been dented, repairing the dented panel is advisable. Apart from straightening the dent, a fresh coat of paint may need to be applied to take care of scratches that may come with denting. If the panel is however damaged beyond repair, the panel may have to be replaced. While replacing the damaged panels sounds easy enough, the truth is that replacement panels are not as easy to find as door panels are designed to fit individual doors and one may need to get an exact door to get the replacement. Putting a new panel on a relatively old garage door may also not be the best course of action as the weight and the appearance of the new panel will be completely different from the other panels. Getting the entire door replaced is often the best option especially where there is extensive damage in two or more garage door panels. The cost of replacing the entire door vis-a-vis the cost of replacing the damaged panels that only serve as a temporary solution is much lower in the long run. What’s even better, the costs required to cover other damages on the door are not incurred and one get to enjoy a new door that only requires minimal maintenance to stay in good shape. As the garage door ages, the garage door panels also age and given that the panels are the most exposed part of the door, the effects of aging will show more here than anywhere else. In the case of age, getting a new door is always the best option. This is because apart from the panels other parts of the door that may not seem as old may need to be replaced as every part of the door that has stood the test of time should be replaced after some time. Most garage doors today come with a life expectancy of 20 to 25 years. It is rather obvious that a door that has been used for more than two decades has become less efficient over time. Replacing the door for a more efficient option is definitely a wise move. Age on garage doors just like with other things in life will show and depending on the care the door has been receiving over the years the panels can look drab and in some cases can even be an eyesore. Getting a new and aesthetically appealing garage door is also much cheaper that getting new panels for an old door that will not hold for long and will eventually have to be replaced. These are some of the common issues with garage door panels that garage owners are likely to encounter. While not much can be done in the case of accidents regular maintenance help in minimizing the costs that may come with expensive repairs when the panels have been neglected for some time. Repairs where panels are involved should be carried out by competent individuals to ensure their integrity and that of the entire garage door is not compromised. Also, getting quality doors with strong panels that will remain strong for years is a worthy investment and is better than buying low quality doors that will have to be replaced after just a few years. Thank goodness for these guys! So, we happen to have some not so well behaved children in our neighborhood. One day a young man decided to use our driveway as a turnaround, but instead of actually turning around, he used our garage as a stopper. We had to contact this fine company to come replace a nice sized door panel and they did an excellent job. Hopefully we never have to, but I will definitely give them a call again.